What’s the hardest item to pack? For most people, shoes are the hardest item to pack. They take up a lot of space, and shoes are too specialized to bring just one pair, even for short trips. On my first backpacking trip to Europe, I carried around a pair of dress shoes. I had heard that you needed nice shoes for “going out” in Europe. For two weeks I lugged around heavy, thick-soled dress shoes. I don’t think I ever wore them. In retrospect, I was an idiot. Luckily, I was carrying around a giant hiking bag. I had plenty of room, but they were still a waste of space and weight. Never again. I’ve learned a lot since then. In this post, I’ll share the shoe packing tactics I’ve learned from other travelers and through trial and error. After reading this post, you’ll know which shoes to bring, where in your bag they go, and how to pack them. We recommend wearing one pair of shoes and, if necessary, packing another pair. Bringing more than two pairs of shoes makes traveling carry-on-only difficult. Removing shoes from your luggage is an easy way to free up space for clothes. For leisure trips, start with a pair of comfortable walking shoes. You’ll be wearing these shoes most of the day. Make sure they won’t hurt your feet. Your second pair of shoes should be packable. They should be light and flat to minimize the amount of space they take up in your luggage. Always pack your lightest pair of shoes. Packing heavy dress shoes, high heels, or boots of any kind is not recommended. I’ve been able to pack lightweight dress shoes in my bag when traveling for a wedding. It’s do-able when necessary, but not a good idea for most trips. Don’t stuff your shoes into your bag on top of your clothes at the last minute. Even lightweight shoes are heavier than most of your clothes. To balance the weight in your bag, pack your shoes in the vertical middle of your bag, as close to your back as possible. Here’s an illustration that should help. Packing your shoes close to your back will keep your bag’s center of gravity near your body. Your pack will feel like an extension of you, not like an unbalanced weight swinging around you. To ensure your shoes are in the right spot, pack your shoes first. Then pack your clothes around them. 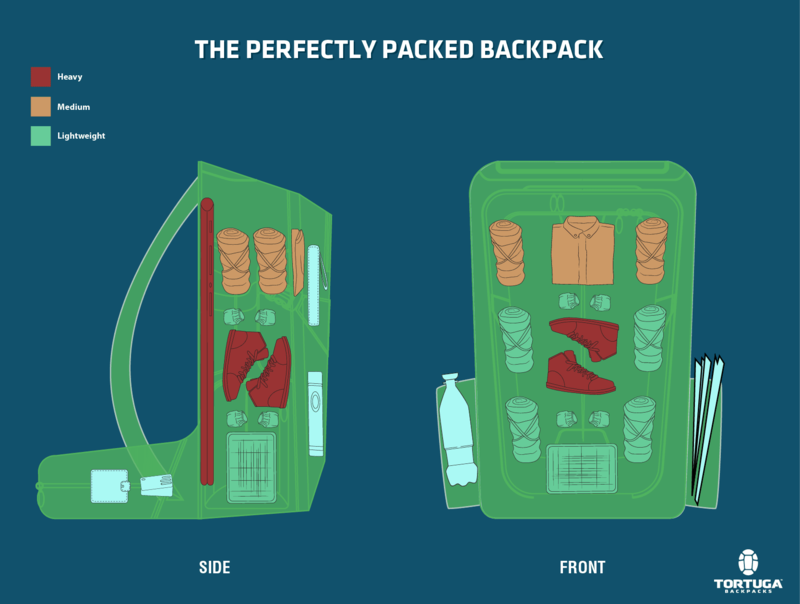 Many travelers pack in the exact opposite order. Starting with your shoes first will result in a better, more efficient pack. The TSA says to, “[p]ack shoes, boots, sneakers, and other footwear on top of other contents in your luggage.” Their advice is for checked, not carry on, luggage. If you’re traveling carry-on-only, you can ignore their recommendation. Your backpack is empty and awaiting your shoes. Now what? Before packing your shoes, stuff them. Don’t waste the space inside of your shoes. That’s valuable real estate. Ball up socks, roll up a belt, or pack anything else that’s soft and can conform to the space, like a t-shirt or underwear. Next, interlock your shoes as shown to the right. The right shoe’s toe should be touching the left shoe’s opening and vice versa. Picture how shoes come packed in a shoe box. Arranging your shoes like this will make them one solid rectangle for packing. Now you can easily pack around the shoes. 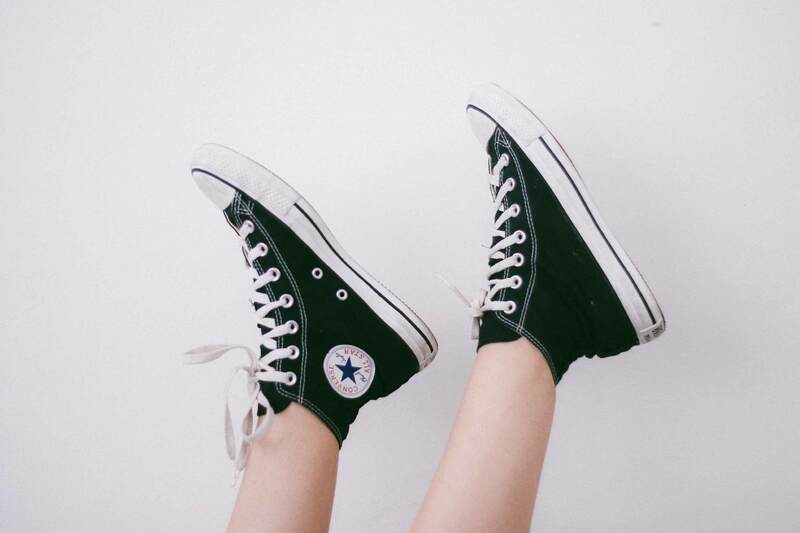 Prevent dirty shoes from ruining your clothes. Wrap your shoes in a plastic grocery bag or a shoe bag. 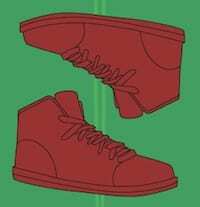 You could also pack your shoes with the soles flush against each other, but this shape is harder to pack around. If you’re carrying flip flops or sandals as your third pair of shoes, pack them along the edge of your backpack for structure. Otherwise, pack sandals in your backpack’s exterior pockets or affix them to the straps. Wear your heaviest shoes, like sneakers or boots, and pack a lighter pair. Place the packed pair in the vertical middle of your bag as close to your body as possible. Stuff socks or belts in your shoes and wrap them up so they don’t dirty your clothes. Find the best shoes for every trip.